In order to foster a culture of safety in an industrial workspace, it is important to consider both employee protection and general physical security. It takes quite a lot of consideration and planning to know what it will take to make workers safe. From there it is a matter of getting all employees to take safety seriously. In order to get the best safety results, physical security can be increased. But let us take on just how that may work. Employees in industrial workspaces face many potential dangers. The range of dangers can include falls, electrocution, crushing, being struck by falling objects, etc. It is important that you know the types of risks that are confronting your workers before trying to devise solutions. For example, in the case of a wastewater plant, there are also chemical concerns. Improper care can lead to gassing and splash back, as well as the concern of falling into the tanks. It is important to cross reference employee tasks with possible risks. Then it must be taken into account types of overlap, such as: if one floor or section of the plant is at risk from possible gassing, any worker whose job requires them to enter this area must be properly trained. Employee protection seems like one of the easier parts of safety to impress upon workers, but it is actually the most likely to fall short. An employee is historically more likely to knowingly risk their own safety for expediency than knowingly compromise any other part of security. This comes from the presence of needless or unexplained safety restrictions, which create a culture of mistrust. In order create a culture of safety, all safety requirements must be purpose and value-based, and benefits must be stressed to workers. 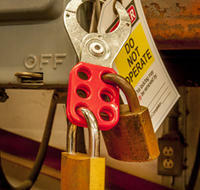 Industrial plants have to be concerned with maintaining a high level of physical security. Unauthorized personnel should not be allowed access to areas that pose potential harm to them or the plant itself. This means strong gate and perimeter security, as well as on-site access control. If it is easy to get into the plant by accident, the chances of an accident are greatly increased. Electronic locks can be used for interior door security, so that level of access is tied to a level of training. This guarantees all personnel in a given space have the proper safety training, or is accompanied by a person with such training. To combat theft of expensive materials and machinery, as well as to restrict use, additional locks may be installed on cabinets, storage lockers, and the machinery itself. All lock installationshould be done by a professional to assure that all security measures are working properly. If the physical security improvements are limited due to budgeting, full modernization can be postponed. Purchasing new security products may need to be put off so that modernization efforts can focus on reducing bottlenecks and increasing efficiency. Regardless, with better key control and manager oversight, physical security can be improved without the use of new materials. Existing locks can be rekeyed with master key protocols, and retraining for heightened vigilance can increase the physical safety of a plant. Oversight and access control take out most of the guesswork in employee cooperation and naturally promote safety protocols. To get the best safety for any industrial plant it takes consideration, investment, and training. Even in an era of modernization and automation, the safety of the workplace is still of the utmost importance. Make sure that employees are secure while working, and do your best to ensure they act in their own self-interest. PreviousPrevious post:Products vs. Solutions Part 2NextNext post:What is Automation EPC?